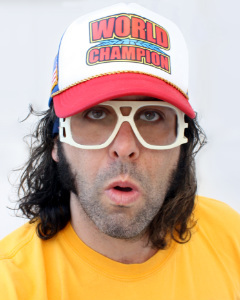 On the comedy stage, Judah Friedlander is the The World Champion. He is the best athlete in the world, greatest martial artist, the sexual desire of every woman, and a role model to children. Let’s face it, Judah is the greatest comedian in the world… And the most humble. Judah is an extra-dark blackbelt in karate. You can watch Judah as “Frank Rossitano” on the Emmy-winning “30 Rock” every night syndication & on Comedy Central. Multiple hilarious appearances on Letterman, Conan, Fallon & The Daily Show.